One of the many factors that are important in ranking at Google is the use of keyword rich links and that is a “secret” Leslie broke in the Spring 2002. Prior to that point, “link popularity” — the simple counting of links — was state-of-the-art. It was not until he realised a piece of software called OptiLink that “Link Reputation” — the analysis of the link text — was born. Fast forward a few years and now even the most basic course in SEO teaches the importance of link text. But that’s not all… a year later Leslie invented a process he called “Dynamic Linking” – a way to control the distribution of PageRank within a website. The SEO community has since named this technique “PageRank Sculpting” and it is widely taught and practiced by advanced SEOs everywhere. Looking back, these two techniques, Link Reputation and PageRank Sculpting, are the mainstay of ranking improvement at Google and are the foundation of much of SEO practice. Leslie truly is the grand master of SEO. Personally I’ve been following his work for the better part of 6 years… first introduced through some consulting work with Jeff Johnson, I soon realised this is a guy you need to listen to. Just a few days ago I was lucky enough to spend some time with the man himself and I recorded the call for your benefit. We talked about all things SEO from endless content to personalised search – be warned though, this is some pretty high level SEO. Click here to download the call… and be sure to post a comment! The BrainTrust is about the entire game of search marketing – from keyword strategy to link building, from Pay-Per-Click to Analytics, Conversion, and Testing… everything that can help you get better rankings, more traffic, and more PROFIT from your business. I’m glad you helped me discover Leslie Rohde Dave. 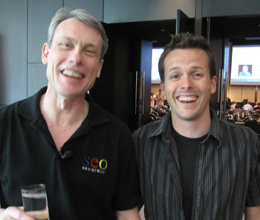 I think he is THE man to listen to when it comes to SEO. Time and time again he has taken the lead in anything and everything SEO. He’s first in line before any other guru. I wonder though what Rohde thinks of Google’s recent drive towards reworking the nature of “search” to take on a more social flavor? I’m keen to keep an eye on Rohde’s future insights on this. I’ll also see if I can get Leslie to comment. Thanks again.